Yesterday, I was asked to take a survey regarding learning styles. The survey consisted of a number of questions about how I favored being presented information. Two answer choices were offered in the format of either A or B, which do you prefer? The final results showed graphs comparing multiple pairings of contrasting learning styles and which ones I favored based on my answers to the survey. The results got me thinking about how we teach our team. One set of learning styles from the survey is visual vs. verbal. 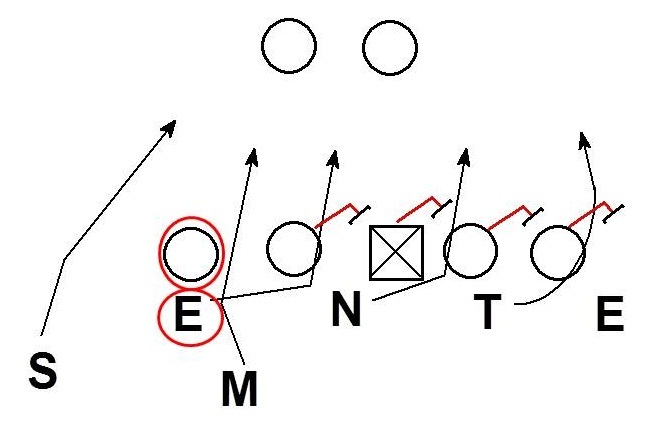 Our coaching staff utilizes the whiteboard, power point, printed playbooks, and technique manuals to help players understand material that is being taught. Some players grasp concepts in writing instantly and others do not. We follow up written material with video playbooks, video cutups, and live demonstrations to show players what they must know. Once a player has attempted the techniques they are shown film of the practice or game. Overall the visual portion covers: those who learn on paper, those who learn by watching others, and those who learn by watching themselves. We address verbal learners by making every effort to utilize a descriptive and consistent vocabulary. I believe the most successful coaches spend more time focused on how they are going to verbalize the coaching points of their scheme and technique than they do on the scheme and technique itself. Also coaches ask players to verbalize the concepts. Some players need to hear themselves explain the material to gain mastery of the material. The player’s verbalization also serves as excellent feedback about how the player has interpreted the information. Overall I think visual and verbal learning styles have received a great deal of attention in our teaching model. The next set of learning styles is sequential vs. global. Do you learn better by looking at the steps that end in the final product (sequential) or do you prefer to see the final product and use that context to better understand the steps to arrive at that product (global)? Much of what we teach focuses on the sequential. When looking at the pass rush we focus on stance, alignment, snap reaction, hand strike, and pass rush moves. Furthermore some pass rush moves are sequential like chop, club, and rip. I believe this is an area we must integrate more global teaching. Showing players the big picture of what we are trying to get done in the pass rush will hopefully inspire more creativity in how we rush the passer. A wise man once said, “If you don’t want them to act like robots, don’t coach them like robots.” The third set of learning styles that got my attention was active vs. reflective. Active learning is a huge piece of the football coaching puzzle. Repetition and development of muscle memory are foundational for all positions. However, reflective learning is another area we only partially address. How many situations do we inspire our players to think about football at a technical level in their pre-game preparation? Our staff gives players film study guides by position group. Players take a weekly scouting report and game plan test on Fridays. But how much do they really reflect and how can we foster more thought? I started thinking of ways we can emphasize global and reflective learning in our teaching model for pass rush. 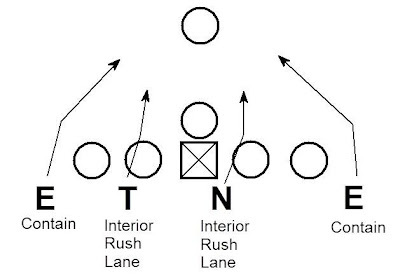 In our baseline teaching the rush is made up of two contain rushers and two interior rush lanes. The contain rushers are responsible to squeeze the pocket. Contain players should not come under a pass block until they reach the depth of the QB. 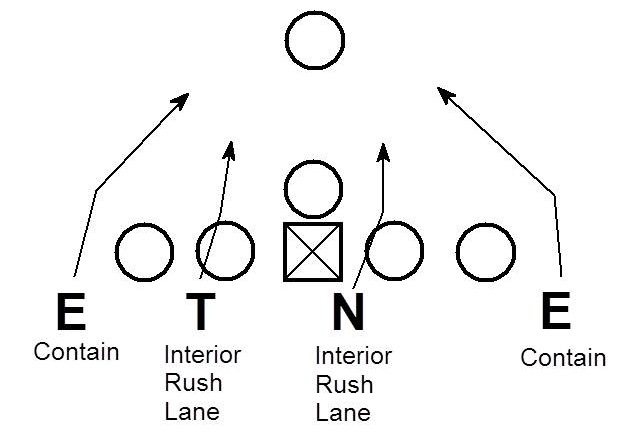 Interior rushers are responsible to push the interior of the line and control the area behind the center. Interior rushers should not cross the center nor end up at a contain width in his rush (stay in the interior rush lane). On a drop back pass the QB is looking to plant his foot on the fifth step and deliver the football to his primary read. Next, he will step forward into the pocket which we call his +1 and look to his next read. He will again step forward on his +2 and look to his final read. Finally, he will look for an opportunity to escape the pocket. In our pass rush philosophy, the throws on the 5th step must be pressured with great snap reaction and takeoff. The +1 and +2 throws are pressured with the combination of the interior push and the contain player’s squeeze. If one of these elements is lacking the QB will be able to step up into the pocket or slide laterally outside the pocket. Rushers must also use their film study to anticipate the QB’s next move. All QB’s have tendencies. Where does he look to escape? How quickly does he look to escape? If he is a runner and abandons his progression before the +1 we must be aware and adjust. If the QB looks to escape early, interior rushers need to be ready to transition to a two-gap technique and disengage from blocks. We must understand when to make that transition. Contain rushers must account for the QB’s change in depth and be ready to come under pass sets when they reach the QB’s depth. 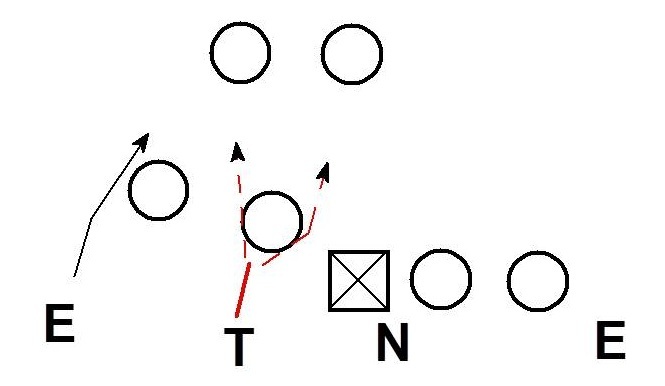 All rushers have an aiming point in relationship to the QB. The contain rushers are aiming for the QB's upfield shoulder. The interior rushers are aiming for the QB's front hip. If the offense changes the launch point for the QB (scramble, half-roll, sprint out, or boot) the pass rusher’s aiming points remain the same. Get to your aiming point no matter where it goes. Players must understand when they have a two-way go on a pass blocker. Here the Tackle has a two-way go on the guard and has the freedom to make an inside pass rush move. The End as a contain player should only come underneath the offensive tackles pass set when he reaches the depth of the QB. We can rush 4 from our 3-4 package by blitzing the OLB and slanting the DL. 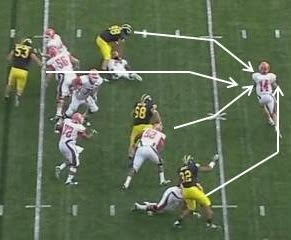 Here the LB is the contain rusher and the End on has a two-way go on the guard. When we execute twists the responsibilities for contain and interior rush will be exchanged. Here the Nose must understand his responsibility is the opposite interior rush lane. The Left DE has his normal contain while the Right DE has a two way go on the guard and is an interior rusher. The DT must loop to contain. As a contain player he must squeeze the pocket. With the DE going on an inside move it is important for the DT to keep his loop tight as to not create an escape lane for the QB. The Tackle must see his contain responsibility in the same way a DE would. All the rushers must understand their new aiming points on the QB. 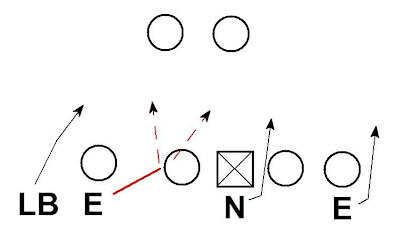 Here the Tackle is asked to go from his normal alignment as a 3 technique to the opposite interior rush lane (B gap to A gap to Opposite A gap) and is responsible for balancing the pass rush. We only coach the first step or takeoff. Our philosophy is to attack with the first step and react on the second step. By understanding his final destination it should help the Tackle understand the best footwork and block shed to get where he needs to go. I often hear coaches complain about why a player made a decision and a player’s lack of football IQ. Perhaps by improving our global teaching model the player will understand the desired outcome and will make better decisions and arrive more often at that outcome. When we bring a blitz the players must understand how that affects their pass rush. Here the Tackle must be aware of the offensive tackle and fight for contain. The OT will look for work when the DE drops into coverage and will try to seal the DT inside. The long stick DE is the interior rusher on the left side and cannot get washed across the center. The Nose is balancing the pass rush. The Nose also has a two-way go on the guard. If the guard is using and overly aggressive slide technique for example the Nose can work an outside edge pass rush move on the guard. Here the tackle knows he has a two-way go on the guard. If the scouting report for our opponent is that the center looks to help with the Nose; the Tackle must be aware of this tendency and the effect on his rush. Because he has a two-way go and a single block the responsibility to push the pocket is almost all his. The Nose meanwhile must understand that if he is being double-teamed he must make sure the center has to keep helping the guard. The worst case scenario is for the center to help initially with the Nose and still be able to help late with the Tackle. If we are running the NCAA blitz and the scouting report on our opponent is that the pass protection is half-slide. If the slide is away from the pressure the DE on the long stick must know what that means. The OT is manned on the DE with the rest of the OL in a slide technique. The DE needs to understand that the OT has him man to man. This will allow the DE to heavy his alignment to make beating the OT across his face easier. Also by getting inside more quickly it creates a more clear pass rush lane for the interior blitzer. The DE must also anticipate that as he goes inside he will feel pressure on his back from the OT. The DE must pry up the field and get to his interior rush lane responsibility. 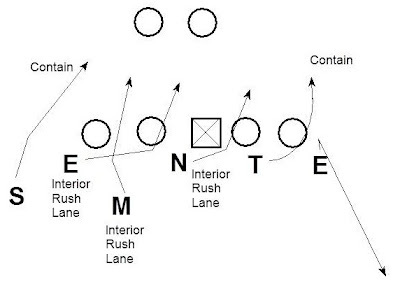 The pry will help insure the DE does not end up being pushed across the center and losing rush lane integrity. Against a slide protection going toward the blitz the DE’s plan must be different. 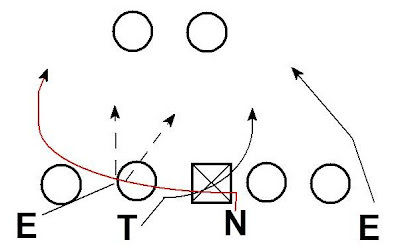 Here the offense uses a full slide protection which allows the RB to have no pass blocking responsibility once the DE drops into coverage. The DE must understand what full slide means for him. If he simply long sticks and is lateral as he goes to the A gap the guard will pass him to the center. Offenses are coaching the guard that if your get the lateral long stick action from the DE you need to pass him and pick up the inside blitzer in the NCAA blitz. If the DE instead attacks and starts to engage the guard on the long stick before ripping across his face into the A gap the guard is in bind. The full slide scheme says the guard has the B gap. The guard only knows what he knows and initially it feels like the DE is going on a single gap slant to his B gap. The guard would need to block the DE in that situation. As the guard figures out what is happening and passes the long stick DE to the center the interior blitzer is already through the B gap and pressuring the QB. We tell our players that the coaches will deliver the big picture breakdown of the opponent but players must learn about the individual they are going against. We give our guys a full checklist of things to watch on film to know what to expect from the OL they will be lining up against. Where we must improve is helping our players understand the game within the game. Players need to develop for themselves a plan of pass rush attack vs. their opponent. They should use the information they gather from their film checklist to develop their plan. If you are a 3 technique expecting a two-way go, how are you going to capitalize on that advantage? If the OL posts (puts lots of weight on) his inside foot when he sees an inside move, how are you going to attack that tendency? Are you going to jab inside and work his outside edge? What will you counter with if he is able to recover? Does the OL over set to a speed rush? Can you get him to over set and work a counter club move to beat him to the inside? I think we have done a good job indoctrinating our guys about earning the right to rush the passer. Our players believe in the idea of stopping the run on 1st and 2nd downs to get themselves in green light pass rush opportunities. Now if we can help our players to do more reflective learning in creating their own pass rush plan of attack we will be even more successful. I think that reflective learning will help our players be more creative in their pass rush. I am also a believer in visualization and if this model encourages our players to visualize more than I am all for it. Overall, I think a player who believes he has earned the right to rush the passer and helped develop his individual plan of attack will be both motivated and excited. We are going to ask players to verbalize their plan against their opponent and practice that plan in our 1on1 pass rush period. We teach our players a number of pass rush techniques and help them to develop their best move and a counter. When we grade practice and games one part of a DL’s grade is a technical grade. Technical grades are based on knowing the call, proper alignment, stance, etc. D-linemen receive a technical grade for every play they are on the field. For pass rush opportunities the DL receive a pass rush move grade. The scale is ++, +, 0,-, -- with a double plus being the best and a double minus being the worst. If a player received a 0, he attempted a pass rush move but it wasn’t successful. If the player was graded +, the pass rush move resulted in pressure and if he received a ++ the pass rush resulted in disruption of the pass. While a grade of – means the DL did not attempt a pass rush move. Typically this means a DL ran directly into the OL and blocked himself. A grade of - - is for a critical error. Critical errors in the pass rush are taking the path of least resistance and leaving your rush lane or losing contain and the offense was able to capitalize. Also giving up on a pass rush earns the grade of --. With HUDL we are able to send out DL film with notes so they can look at their pass rush grades from practice and games. I think we can use this film to guide our DL as they develop their pass rush plan. We work hard to coach finish to our team. For pass rush finish means: sacks, disrupted passes, and strips. We chart every practice in terms of pass rush production and post the results in the locker room. Players take the competition seriously and want to be the best pass rusher each day. This will also serve as a tool to help guide players in developing their pass rush attack. What worked and what didn’t? Overall I think by helping players understand the big picture (global learning) and challenging them to think (reflective learning) we will build better pass rushers. I also think these concepts will help us make in game adjustments as well as help players self-correct. If a player isn’t seeing on the field what he expected based on game plan he will be able to communicate that to coaches between series. Also the hope is that the player can evaluate what is happening to him and adjust his pass rush plan during the game. This type of self-correction is only possible if the player fully understands the bigger pass rush picture and has thought about what his other possible plans of action might be. Concussions have become a hot button issue across all levels of football. When will a comprehensive independent safety study of what is the safest helmet and safest mouthpiece exist? Currently there are multiple companies claiming to have the safest product for preventing concussions but where is the proof? I have heard "testing in very expensive" and "it is difficult to replicate actual football conditions in a lab" as possible explanations for why no study exists. Who is going to pay for it? Will it be accurate? I don't have the answers to those questions. What I do know is there are 631 football playing college teams in the NCAA that could serve as real world data collectors. All of these teams have a full time athletic trainer. It seems fairly low cost for the NCAA to simply ask team trainers to document every concussion on their team and what manufacturer and model of helmet the player was wearing when they sustained the injury. While this data might not be conclusive; it could serve as a guide for purchasing the safest helmet possible. Data could also be easily collected from JUCO, NAIA, and NFL teams. More 4-2-5 resources from Coach Hoover available here. 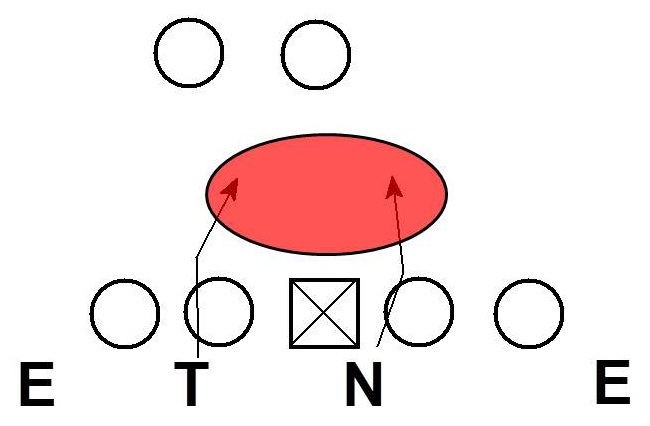 A nice post on hybridization of the OLB/DE in a muliple 3-4 scheme from Compete in All Things is available here. These types of hybrid players are in my opinion the key to defensive evolution moving forward. Also a short interview I did for Sports Deck Blog is available here. The original Wildcat package at the University of Arkansas was run from 1 unbalanced formation. What made the Wildcat so effective early on was the unbalanced formation with the QB flexed out at receiver. With the QB still on the field the defense couldn't tell if the offense was going to run the Wildcat or traditional 22 personnel formations and plays before they broke the huddle. Defenses initially had trouble dealing with the tackle over unbalanced, motion, and treating the QB as a receiver. 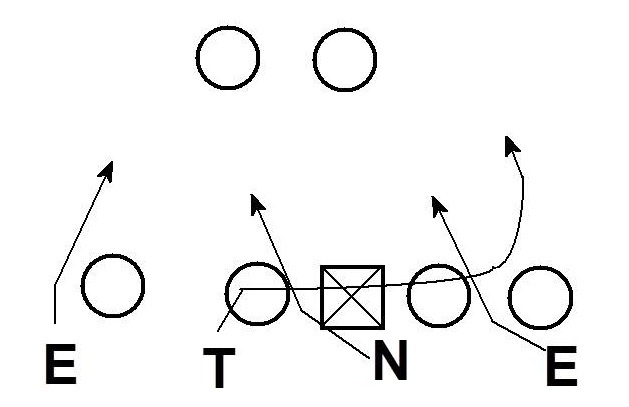 Jet sweep, power, inside zone, and counter are the plays that made up the basic Wildcat attack. 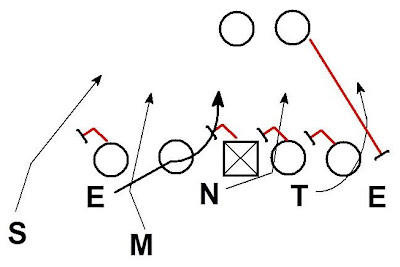 If defenses didn’t adjust to the unbalanced correctly you were out leveraged and the jet sweep got to the perimeter. If the defense didn’t have enough bodies in the box or over played the jet sweep the power play would hit off the strong side edge. When teams over shifted to the unbalanced to stop the sweep and power the counter play allowed the offense to exploit the undermanned weak side of the formation. Inside zone was a complimentary play that could be run strong or weak and allowed the offense to have 3 double teams inside. Video of the wildcat from Arkansas is available here. The first rule to playing defense is to get lined up and the Wildcat made that more difficult than traditional formations. 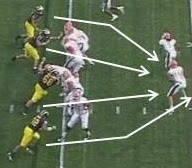 By having the "QB" taking the direct snap the offense had a hat for a hat when blocking the core. A great deal of the Wildcat’s success was tied to the formation, but what was initially the Wildcat’s strength became its Achilles heel. Because the Wildcat was being run with a RB at QB the threat of pass was extremely limited. Also Wildcat teams were lining up a QB at WR which further limited passing options. One solution is to limit the coverage to the QB. There is a low probability he is being thrown the ball so why cover him? 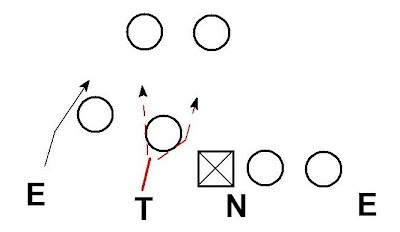 The concept often includes bringing a blitzing corner (cowboy). 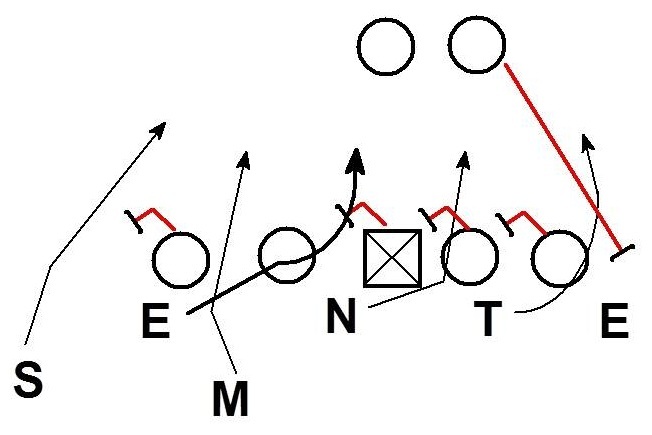 The concept is basically cover 2 with the corner blitzing instead of playing the flat. The SS should be able to handle the limited pass threat as the RB is unlikely to throw the hole shot on the sideline. The blitzing corner made running the jet sweep difficult and allowed the front to handle the plays in the core with minimal adjustment. Another corner blitz solution was to bring the corner to the motion. By blitzing the backside corner the defense is able to attack the running back and help eliminate the power, counter and inside zone plays. 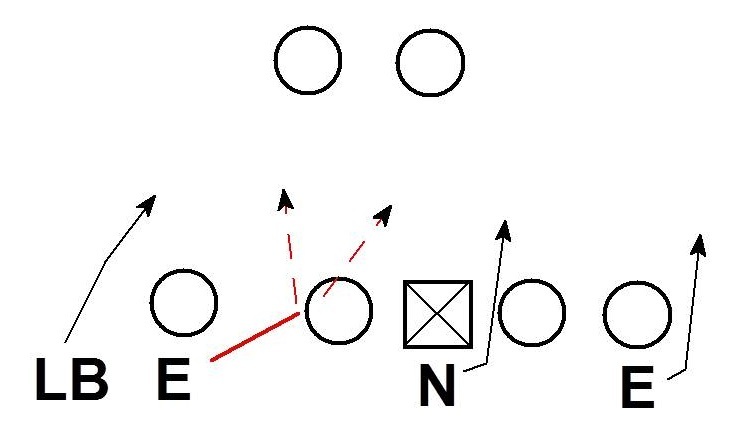 Using the backside corner in pressure allows more flexibility in the rest of the defense to adjust to the unbalanced and jet sweep.To take it a step further, you can blitz both corners (double cowboys). 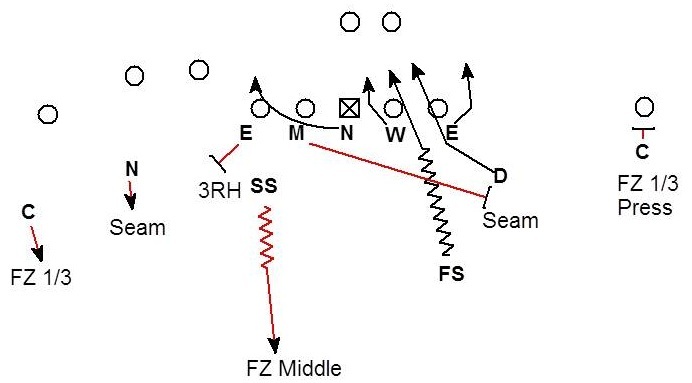 Now there is a blitzer attacking both elements of the wildcat package (sweep and "QB"). The FS can key the H-back and help defend the weak side on counter and inside zone plays while staying front side on sweep and power. The TE is still a pass threat, although an unlikely one. One solution is to utilize the TCU cop concept and man the DE on the TE. As defenses have evolved the Wildcat was forced to evolve or die. The issue was there wasn’t anywhere for the Wildcat to evolve. The pass game was never going to feature play action and boot, nor is it likely quick game, drop back pass, or screen will make an appearance. The run game was basically maxed out and defensive schemes were cranked up to attack the run. The only solution left was to adjust the formation. 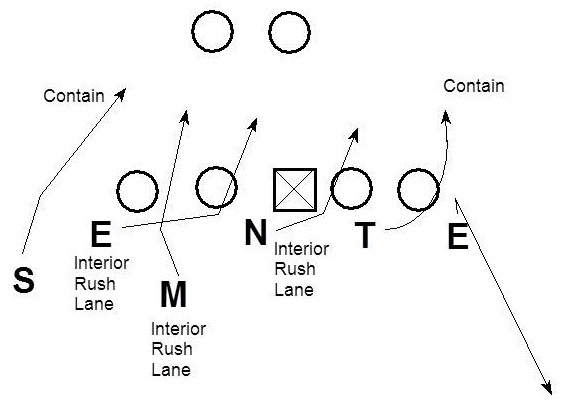 Unfortunately for the Razorbacks and the Miami Dolphins other formations have not had the same success as the original. I don't know if the Wildcat is gone for good, but I do know that offenses will have to find a solution to the corner blitz if it is going to make a comeback. Haven't posted in a while so here goes. This is a weak side overload blitz the Rams used earlier in the season vs. the Cardinals. This blitz is run from an odd front dime package. Video of this blitz is available here on the NFL website. Steve Spagnuolo is always a good source for innovative blitz concepts. However, this blitz happens to be the exact same pressure used last season against the Cardinals. I wrote about it in an overload blitz post from last December. The 2010 version was used on a 3rd & 6 vs. a bunch formation. The 2011 incarnation was used on 3rd & 9 vs. a traditional trips set. The video is almost identical.